Prime Minister Nguyen Xuan Phuc on September 11 affirmed that the Vietnam – Republic of Korea relations and cooperation have been developing vigorously and effectively in every field since the state-visit to Vietnam by RoK President Moon Jae-in earlier this year. He made the statement while receiving RoK Foreign Minister Kang Kyung-wha, who is heading the country’s delegation to the World Economic Forum on ASEAN (WEF ASEAN) 2018 now underway in Ha Noi. 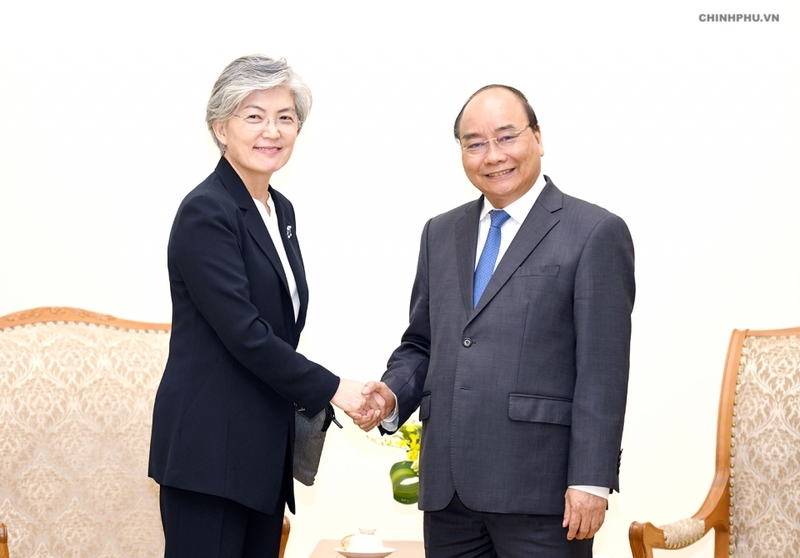 Prime Minister Nguyen Xuan Phuc receives RoK Foreign Minister Kang Kyung-wha. During the reception, the Government leader asked the two sides to continue maintaining the high-level contacts and to closely coordinate with each other to accelerate the bilateral cooperation in every field, especially in investment, and to facilitate Vietnam’s exports to the market in the RoK so as to narrow the trade imbalance. PM Phuc also stressed that the two should strengthen their cooperation on science and technology to meet the new requirements of the Fourth Industrial Revolution. Besides, PM Phuc also said he hopes the RoK will soon take effective measures to assist Vietnam in building an e-government, and asked the RoK Foreign Ministry to help the Vietnamese country in the country. Foreign Minister Kang conveyed regards from President Moon Jae-in to the host and spoke highly of the socio-economic development and international integration recorded by Vietnam in the recent past. She said the RoK attaches great importance to the boosting of the relations and cooperation with Vietnam and stands ready to join hands with the country in solving the issues in trade. The RoK will help the Vietnamese community in the country and share experiences with Vietnam in building an e-government, FM Kang stressed, adding that she herself and her ministry will continue closely coordinating with Vietnam in accelerating the implementation of the high-level agreement in a practical and effective way, thus contributing to the bringing of the bilateral relations to a new height. The potential for cooperation between Vietnam and the US remains huge, especially in trade and investment, Prime Minister Nguyen Xuan Phuc has said.